The best person to tell a young person about the Gospel is another young person. One of the main reasons people don't share their faith with their friends is lack of confidence. We have a wonderful story to tell, we just need to become great storytellers. We want to give young people the skills and confidence to be able to share their faith with their friends. We are working with churches to help them develop their young people in evangelism. We are also working with young people through gap year programmes and mentoring to build them up to share their faith effectively with their friends. Gloucestershire has approximately 150,000 young people under the age of 25; we cannot reach them on our own, but with young people actively sharing their faith it becomes possible. One of our three strategic priorities is equipping young people for evangelism. If we are to see 15,000 young people in Gloucestershire respond to Christ we need as many young people as possible confident in sharing their faith. The number one reason that people do not share their faith is because they do not feel they have the skills to do so. Many of us are fearful of sharing our faith, whether we are young or old. Despite our reluctance, research indicates that young people are open to hearing about Jesus. 56% of young people feel comfortable when talked to about Jesus. 1 in 6 young people want to know more about Jesus. 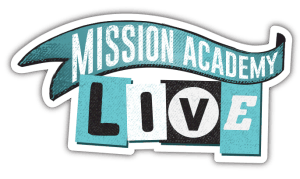 Mission Academy Live is an initiative from Hope Revolution that aims to empower and encourage young people to share their faith and to follow the command of Christ to “Go and make disciples”. We have agreed to be a Mission Academy Hub for Gloucestershire, facilitating other groups in the area and providing an evangelistic event to which young people can bring their friends. Mission Academy groups will run a series of ten sessions with young people, which could be over ten weeks or better still over ten months. During that time young people will be encouraged to reach six of their friends with the Gospel. As the year progresses we will run an evangelistic event to which the young people can invite their six friends. As well as being the regional hub we will also be running a Missional Academy small group starting in 2018. Any young people who don’t have a group to attend in their church will be welcome to join us. More details will be released nearer the time. The regional launch of Hope Mission Academy Live takes place in Bristol on Saturday 4th November. We are looking to take a group down, why not join us to be inspired and encouraged to be part of a movement of young people reaching their peers for Jesus?